Tom Hanks, Halle Berry, Jim Broadbent, Hugo Weaving, Ben Wishaw, Susan Sarandon, Hugh Grant. Directed by Tom Tykwer, Andy Wachowski and Lana Wachowski. 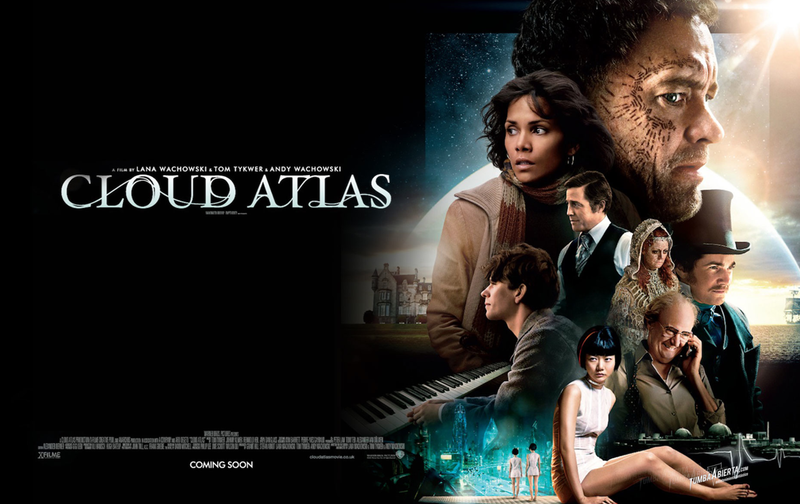 For many, this list alone would be enough to make it worth seeing Cloud Atlas. For others, it is having read the novel by David Mitchell (I believe it is not that David Mitchell). Still others would have seen the trailer and been amazed at the sheer scale of the project. I think it is impossible to summarise the plot in any simple fashion. It covers a multitude of characters over time, place, even on different planets. The characters are linked, although it is not always clear how or why. It’s pretty fascinating to see how the story has been created. I must admit, I started watching expecting that I would hate this film, and hate it a lot. That’s certainly where I started. There were snippets of plot introducing characters but then flitting away before I had the chance to find out much about them. The amount of prosthetic work and make-up was annoying, and I’m not really a massive fan of fantasy as a genre. Once I had committed to disliking the film, a strange thing happened. I started to really like it. A lot. I let go my previous convictions and just enjoyed it for what it was. And it was good. Not brilliant, but a good, solid fantasy film. Though I did wonder about the Hugo Weaving character that was an awful lot like Old Gregg from The Mighty Boosh… anyone who can explain that to me, I’d be greatly appreciative. As has often happened for me, this has inspired me to read the book, although I think I need some time between watching the film and reading the book.